Julian is considered by many as the greatest classic guitarist of the twentieth century, as if this were not enough he quietly re invented the renaissance lute and brought it to a new audience. Written for Bream, Benjamin Britten's 'Nocturnal' Op. 70, is widely regarded as the centerpiece of the modern guitar repertoire and this masterpiece forms an appropriate frame for Julian's story. 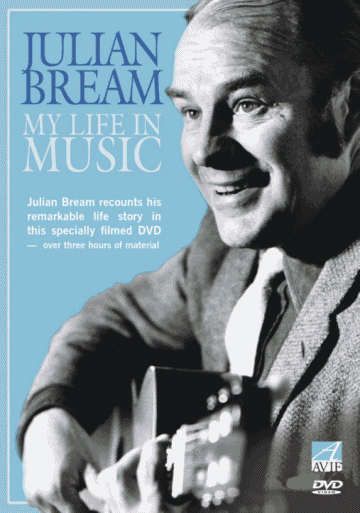 Director Paul Balmer returned Bream to Aldeburgh, revisiting the original manuscript at Britten's home. This culminated in the guitarist coming out of retirement to perform complete movements of the Britten and the de Falla 'Homenaje' which inspired it, all in the wonderful acoustic of the Snape Maltings. We also hear Julian perform Richard Rodney Bennett's Sonata for Solo Guitar, in an exclusive BBC Radio 3 digital recording, never before commercially available. 195 minutes. Subtitles: PAL version- English, French, Spanish and German. NTSC Version: English and Japanese. 3 'HEIGH HO HOLIDAY' 1'10"
4 "I was born in Battersea" 1'27"
5 "My musical father" 1'48"
6 DJANGO AND EDDIE LANG 3'28"
7 "My first spanish guitar and meeting Segovia" 5'02"
8 'BMG' AND THE PHILHARMONIC SOCIETY OF GUITARISTS 4'52"
9 THE 'PSG' LIBRARY 1'08"
10 A DAY BOY AT ROYAL COLLEGE OF MUSIC 1'10"
11 SEGOVIA 1947 / CASTELNUOVO-TEDESCO 2'43"
12 SARABAND FOR DEAD LOVERS 1'07"
13 "Royal College of Music - no fee " 2'43"
14 BBC RADIO AND TELEVISION 5'22"
15 JULIAN DISCOVERS DOWLAND 2'43"
16 WIGMORE DEBUT / BACH SUITES 6'48"
18 ALDEBURGH - MEETING BRITTEN AND PEARS 5'11"
20 IMPROVISING AS A RESOURCE 2'49"
21 THE JULIAN BREAM CONSORT 4'42"
22 MEETING ALI AKBAR KHAN 3'56"
24 'A LIFE IN THE COUNTRY' / CRICKET - A PASSION 5'15"
25 RECORDING AT WARDOUR CASTLE 2'38"
26 THE RENAISSANCE AND BAROQUE GUITARS 5'08"
27 WHAT IS ESSENTIALLY SPANISH 5'09"
28 NEW MUSIC FOR THE GUITAR 6'05"
29 WORKING WITH JOHN WILLIAMS 3'36"
30 ALDEBURGH AND THE WRITING OF 'NOCTURNAL' 5'04"
31 DE FALLA 'HOMENAJE' 4'15"
32 'COME HEAVY SLEEPE' - 'PASSACAGLIA' 8'32"
* The 'Nocturnal' manuscripts - Julian sees Benjamin Britten's original score for the first time. * '1984' and bouncing back - how Julian recovered from his near tragic car accident. * "My first recital and the Maccaferri guitar"
* "Sneaking my guitar into the Royal College of Music"
* RCM tutor: "Fernando Sor ! … never heard of him"
'THE MAKERS OF …' - a look behind the scenes directed by Emilio Pujol's pupil Brendan McCormack. BIBLIOGRAPHY - some selected further reading. DISCOGRAPHY - compiled by Judy Caine and distinguished author Graham Wade. RESEARCH NOTES - Judy's revelations on where the archive came from ! Once again the Canadians are the most scrupulous conservators. GUITAR TIMELINE - a look at some guitars from the Renaissance to the 20th Century. This is linked to the main profile to enable you to see examples of some of the guitars being played. RARE STILLS PHOTO MONTAGE - to the music of Tarrega's Mazurka in G.